September 5th, 2018: The first official meeting of the year was held in STAT 006 from 4-5pm. 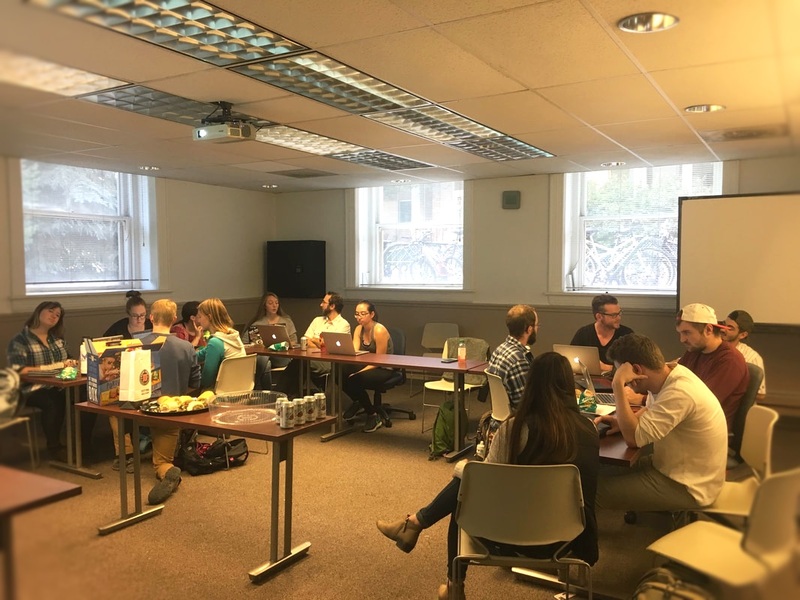 We gave introductions and having Brooke Anderson speak to us-- Brooke works on projects with Environmental and Public Health applications and has a lot of experience building and publishing R packages, running hackathons, and trying to make code accessible. September 8th, 2018: The Statistics Department's annual fall picnic potluck at Spring Canyon Community Park to meet faculty, staff, and graduate students within the Stat Department! Make sure to sign up and bring a dish to share! Email us for more details! September 19th, 2018: We bought and made cookies and used data we collected while tabling on the Plaza to predict which cookies people would believe would be the best. Afterwards, we compared the predictions with the results. 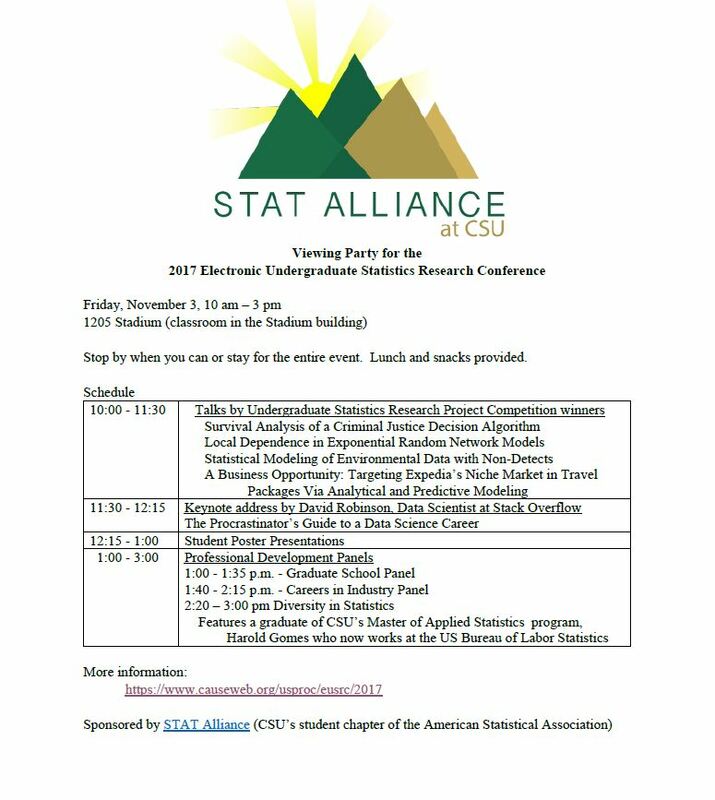 Come join us Friday, November 3 for a viewing party of the 2017 Electronic Undergraduate Statistics Research Conference. We will be in classroom 1205 in the new stadium from 10-3! Lunch and snacks will be provided! Come for the whole event or stop by when you can! Here are the minutes from tonight's meeting. Our next meeting is October 24th in Stat 006 at 5pm. Co-Wy Chapter Meeting is October 27th in Aurora, 8am-5:30pm. It is a Friday, so if you would like to go, we can help you organize carpool and getting an excuse note for classes. Jennifer Hoeting Presentation on Graduate School on Friday, October 13th 3:00-3:5pm in Weber 237. Will be talking about how to apply, getting paid to attend grad school, biostatistics versus statistics, pathways to get into grad school, pathways within grad school, etc. Next meeting October 24th will have a presentation by Caroline from her work at the CU Med program. She worked in SPSS. Please RSVP for the October 24th meeting at 5pm in Stat 006 on the homepage of the website so we can get an accurate count for food. Hello everyone! Our next and last meeting of the semester will be April 25th. Make sure to come because we will be having a pot luck at the time! Mary Meyer came by to tell us about the First Annual CNS Probability Casino, expected to be held at Laurel Village in Mid-February next year. If you are interested in joining, undergraduates on the Organizational Committee will need to register for a one-credit independent study class for the Fall semester. At the very least, undergraduates will need to have taken Stat 315, and preferably at least Stat 420. The class will be Stat 495 Section 2, and you would be required to speak to Kristen to get an override. For more information, email Mary Meyer, or either of the graduate advisors or officers, and we will get you more information. CO/WY chapter meeting is next week at NCAR (National Center for Atmospheric Research), and you can get an approved absence for it. Speak to Josh, Miranda, or Jackson and they will help get you the information you need for that. We will be carpooling there and back, and it is a whole day event. Our Bee project with the ecology department is going along buzzingly. We will have another session meeting at the Wild Boar on Friday from 4pm to 6pm. Josh gave us a super cool presentation on a quick intro to Bayesian Statistics by example! If you are interested in learning more about Bayesian, register for Stat 440.